Oklahoma State University in Stillwater, Oklahoma is a public research and land-grant university that ranked 145th in U.S. News & World Report's 2015 list of the best national universities. Institutional grants or scholarships are provided to 72% of full-time beginning undergraduates, with students receiving an average institutional gift award of $6,075. Automatic scholarship opportunities for academically outstanding freshmen include the Academic Excellence Award, which provides up to $2,000, the Academic Opportunity Award, which provides up to $2,500, the Valedictorian Scholarship, which provides up to $1,250 and the National Merit Scholarship, which provides up to $12,900. The school also offers competitive scholarships for incoming freshmen, like the $2,500 President's Distinguished Scholarship and the $1,500 President's Leadership Council Scholarship. Students from across the country and more than 120 countries are drawn to the exceptional academic programs and strong sense of community that they find at the University of Oklahoma Norman Campus. The National Merit Scholars program ($66,000) is reserved for incoming freshmen who are National Merit finalists and who named OU as their first-choice university. Other merit-based scholarships for academically outstanding students include the following: Oklahoma State Regents' Academic Scholars Program ($38,000), Oklahoma State Regents' Institutional Nominee ($25,200), Award of Excellence ($3,000/year), Distinguished Scholar ($2,500/year), University Scholar ($1,500/year), and the Academic Achievement Award ($1,000/year). Entering freshmen who were ranked first or second in their high school graduating class may be eligible for the Valedictorian/Salutatorian Scholarship ($2,500/year). The students at the University of Central Oklahoma have the option of pursuing one of 114 undergraduate majors and 63 graduate majors offered by the university. Qualified freshmen are considered for the following merit-based scholarships: the Presidential Leadership Scholarship ($3,500 towards tuition, plus half of residence hall housing and meal contract) and the Leaders of Tomorrow Scholarship (up to $2,000 tuition waiver, plus $500 book voucher). Each program awards 15 scholarships per year. Students whose total family income is less than $50,000 per year may be eligible for The Oklahoma Promise, also known as OHLAP. This is a program of the state of Oklahoma that pays for the college tuition of qualified students attending any college in the state. Oklahoma Baptist University is a Christian liberal arts institution that offers 87 undergraduate majors, five master's degrees and eight certificate programs. The University offers financial aid to 100% of full-time beginning undergraduates. Of these students, 100% receive institutional scholarships or grants of some kind. Full-tuition scholarships include the University Scholar Scholarship, the Allen Academic Scholarship and the Martin Academic Scholarship. Incoming freshmen are also eligible for the $9,000 President's Academic Scholarship, the $10,000 Trustee's Academic Scholarship and the $12,000 Founder's Academic Scholarship. Institutional grants include the renewable Academic Grant ($2,000 to $5,000 per year) and the need-based OBU Bison Grant. Transfer students are eligible for Dean Transfer Academic Scholarships, which range between $5,500 and $7,500 per year depending on a student's GPA. The Sooner State wants you to get an affordable higher education. Oklahoma’s average price tag for in-state tuition at a four-year public college is significantly cheaper than the national average. And you can still get aid on top of that. In addition to the scholarships offered by big schools with large endowments, such as University of Oklahoma, state financial aid programs can pick up the slack for students who have decided to stay in the state for college. If you’re an underclassman in high school and your family has a modest income, apply for Oklahoma’s Promise right away. Graduates of the program earn free tuition to a state school. If you’re older, do the FAFSA and explore the links below to start planning your college career in the Sooner State. We’ve even included information about college, government and nonprofit services that can keep your cost of living almost as low as your tuition payments. Oklahoma makes it easy to transfer college credit between public institutions in the state. Some students may also find that it isn’t difficult to transfer between public and private institutions as well, as many independent colleges and universities participate in the state’s course equivalency tables. Oklahoma offers a transferable core of lower-division courses, a statewide guaranteed transfer of associate degrees and a statewide course transfer tool. In Oklahoma’s course equivalency tables, you’ll find thousands of courses that will count as equivalents among public (and some private) educational institutions within the state. All undergraduate degrees except the associate in applied science require a minimum of 37 hours in specified required courses, and this makes up a transferable core of lower-division courses. General education requirements for associate of arts and associate of science degrees are accepted for bachelor’s degree programs in Oklahoma as well. Students who want to investigate transfer of specific courses can use Oklahoma’s course transfer tool, which lists course equivalencies for the last five years. If you need college to be cheap, Oklahoma might be the right place. As if to prove it, the state has a dizzying array of government-sponsored websites focused on education. There’s the Oklahoma College Assistance Program, which touches on financial readiness for college. How about OKCollegeStart? It covers securing federal, state and private financial aid and deciding where to apply. Then there’s Reach Higher, an affordable degree completion program for adult learners. And don’t forget UCanGo2, which is about preparing and paying for college regardless of your age or current education level. But these and other sites all have something in common: You’ll get linked to them if you spend just half an hour on the Oklahoma State Regents for Higher Education website. That’s the place you really want, because it’s in charge of administering state financial aid, including multiple merit scholarships and two need-based grants, one each for private colleges and public ones. The Regents website also gives a snapshot of all the schools that make up the Oklahoma postsecondary scene so you can make an informed decision about where to go. There are a few sites you’ll want to head to on your own. These include the Oklahoma 529 College Savings Plan, which is perfect if you (or your children) are a few years away from school and want to earn interest on the money you’ve tucked away for college. Another one is Oklahoma’s Promise, a full scholarship program that targets eight through 10th graders from low- and middle-income families. And the last, Physician Manpower Training Commission, is just for healthcare workers, who will want to explore the loan forgiveness programs available, whether they are just thinking about a degree or already have one. Summary: Oklahoma residents with financial need can get OTAG to attend most Oklahoma universities, both public and private. Annual awards for public college and technology center enrollees is capped at 75 percent of tuition and fees or $1,000, whichever is less. Private school enrollees can get up to $1,300 annually. Eligibility: Eligibility is based on the Expected Family Contribution for college, as determined by the FAFSA. How to Apply: All you have to do is submit the FAFSA after January 1st. Funds are distributed on a first come, first served basis. Summary: Oklahoma residents can get $2,000 per year to attend a private nonprofit college in the state. Eligibility: Full-time enrollees with family incomes under $50,000 qualify. They must be seeking their first bachelor’s degree and have demonstrable financial need. How to Apply: Just submit the FAFSA after January 1st. The award will be applied automatically for selected students. Summary: This four-year scholarship comes in three flavors: $5,500 per year for full-time enrollees at the University of Oklahoma, Oklahoma State University or The University of Tulsa; $4,000 at other Oklahoma four-year colleges, either public or private; and $3,500 at state two-year colleges. Eligibility: Students have four routes to eligibility: becoming a National Merit Scholar or National Merit Finalist, being named a U.S. Presidential Scholar, scoring above the 99.4 percentile on the ACT or SAT, or being nominated by a public college they already attend (though these nominees earn a smaller scholarship). Out-of-state scholars qualify but do not automatically receive an award. To keep the award, students must earn a 3.25 cumulative GPA. How to Apply: If you qualify based on standardized test scores, grab an application on OKCollegeStart.org. If you qualify through the National Merit or U.S. Presidential Scholar programs, contact the college’s financial aid office. Summary: There are no chiropractic colleges in Oklahoma. To encourage residents to take up the profession, the state gives students up to $6,000 a year to pursue a degree across state lines. Eligibility: Long-term residents (five years) can apply once they’ve been accepted to an accredited program. To keep the award, students must earn a 3.0 cumulative GPA. How to Apply: Apply by May 31st after downloading the application from OKCollegeStart.org. Initial applicants must show proof of acceptance, whereas reapplying students must submit a transcript. Summary: Full-time underclassmen can get $1,000 per year and upperclassmen can get $1,500 (part-time students get half that) to apply toward an education degree if they commit to teaching a subject in which there’s a teacher shortage. Eligibility: Oklahoma residents dedicated to staying in the state for three years after graduation qualify. How to Apply: Colleges nominate students on the basis of high school GPA, standardized test scores, enrollment or undergraduate record. Contact your school to discuss its internal application process. You’ll need proof of GPA or ACT/SAT score if you’re an incoming freshman (or college transcripts if you’re renewing). There’s also an essay, which you have to write even if you’re not an English teacher. Summary: This highly selective scholarship goes to future public servants. It’s a nonrenewable award of $1,000 that includes attendance at Nigh Institute seminars. Eligibility: To be eligible, students must be Oklahoma residents enrolled full time in a degree program leading to a public service career. How to Apply: You don’t have to do anything. Each college nominates one recipient based on academic performance and extracurricular involvement. Summary: Eighth, ninth and 10th graders can set themselves up for free Oklahoma public college tuition (or an equivalent portion of private tuition) down the road by signing up for the Oklahoma’s Promise program. Eligibility: To enroll in the program, students’ parents must earn less than $50,000 annually. To successfully complete the program, they must take 17 college prep courses, racking up a 2.5 cumulative GPA. How to Apply: Keep an eye out for applications. They come out around August every year. Summary: Eleven of the state’s public four-year universities (all but University of Oklahoma and Oklahoma State University) participate in this program, which waives undergraduate tuition for high-achieving high schoolers and gives them $3,000 a year toward other college costs. Eligibility: Oklahoma residents qualify if they either earn an ACT score of 30 or are named a National Merit Semifinalist or Commended Student. How to Apply: If you’re eligible, contact your school’s financial aid office for application instructions. Summary: Child care professionals can get help going back to school to earn a degree or certification. There are separate pots for those getting a certificate or associate degree, a Child Development Associate credential, and a Certified Child Care Professional credential. Eligibility: Before applying, applicants must work as child care professionals 30 hours a week for six months at a facility with at least one star and 10 percent of its children on subsidies. How to Apply: You’ll need to submit several forms, including one verifying employment. Summary: Get a $1,000-per-month loan for a family practice/family medicine residency and have it forgiven by working in a rural community in Oklahoma afterward. Eligibility: Enrollees in a family practice or family medicine program in the state are eligible, but they must find a rural community that agrees to provide matching funds for the program. How to Apply: Submit an application to the Physician Manpower Training Commission (PMTC). Before receiving any money, you’ll have to sign a contract binding you to work in a rural area. Summary: Prospective LPN, ADN, BSN and MSN degree-holders can receive forgivable loans if they agree to stay in the state to work after graduation. The higher the degree level, the more the funding, maxing out at $2,500 a year for BSN and MSN students. If they find an employer before starting the program, they can receive matching funds to double that amount. Eligibility: Applicants must be Oklahoma residents who have already been accepted into a nursing program. How to Apply: Have your enrollment and grades/test scores certified by the school, and submit them along with the application and your tax return. If you’re applying for a matching scholarship, your future employer must fill out the application’s sponsor section. Summary: Primary care physicians who set up a practice in approved rural communities can practically write off their debts — this program will pay up to $160,000 in medical school loans. Eligibility: Doctors with loans who are licensed in the state can apply if they aren’t already practicing in a rural area. They must not have benefited from another PMTC program. There are also stipulations on their practice, which must accept SoonerCare (Medicaid). How to Apply: Submit an application to the PMTC. Before receiving any money, you’ll have to sign a contract binding you to work in a rural area upon graduation. Summary: PAs can get a $1,000-per-month loan for their program costs, and then have it forgiven by working after graduation in a town in Oklahoma with less than 20,000 people. Eligibility: Oklahoma residents in a physician assistant program qualify. How to Apply: Submit an application to the PMTC. Before receiving any money, you’ll have to sign a contract. Summary: Students of either allopathic or osteopathic medicine can get $15,000 a year in forgivable loans for up to four years in exchange for practicing in a rural Oklahoma community for an equal number of years. Eligibility: Oklahoma residents accepted to a medical school and who plan to be primary care physicians can apply. Summary: Not all the Oklahoma loan repayment programs are for healthcare workers. Math and science teachers can also get federal and private loans forgiven, though the allowable amounts change annually. Eligibility: Certificate-holding graduates of teacher education programs in Oklahoma can start getting loan disbursements after teaching math or science at a state public school for one year. How to Apply: Submit a Participation Agreement Form to your college’s TSEIP coordinator before graduating. Summary: Children of Oklahoma servicemen and women who died while on duty needn’t worry about tuition. This scholarship covers enrollment at an Oklahoma public university or community college (or can be be applied toward private or public technology center enrollment). Eligibility: The veterans must have died in the 21st century, and both the veteran and student must have Oklahoma residency. Children 21 and older are not eligible to apply. How to Apply: Contact the Oklahoma State Regents for Higher Education for application instructions. Summary: Oklahoma National Guard members don’t pay tuition for undergraduate programs at public colleges in the state. Eligibility: To be eligible, the National Guard members must be Oklahoma residents who don’t already hold a bachelor’s or master’s degree. How to Apply: Submit a Statement of Understanding and Certificate of Basic Eligibility to your college each semester. The latter must be signed by your commander. Contact the Oklahoma National Guard for more details. Summary: If students find a program they like in another Southern state but it’s not available in Oklahoma, the Academic Common Market allows them to enroll in it and pay in-state tuition. Eligibility: Oklahoma residents are eligible. How to Apply: If your program qualifies and you have been accepted to it, submit the Application and Residency Certification Form with a copy of your acceptance letter to the Oklahoma State Regents for Higher Education. Summary: Former and current foster children who have graduated high school in the last three years can apply for a tuition waiver. It can be applied at a public college or for specific programs at a technology center. Eligibility: Students who were wards of the state for nine or more months after turning 16 are eligible. The logo for the Oklahoma Department of Human Services features a hand reaching out to help. It’s an apt illustration for what the department does. There are a few specific DHS programs college students of limited means should look into to make college living affordable. These include the Supplemental Nutritional Assistance Program (formerly known as food stamps), which can net a family of three up to $500 in grocery money per month; the Low Income Home Energy Assistance Program, which gets families through hot summers and cold winters for cheap by paying a portion of their energy bills; and the Child Care Subsidy, which gives money to parents who need their kids to be watched while they attend school. See if you’re eligible right now by logging on to OKDHS Live!. It will also let you know if you qualify for SoonerCare, the state’s version of Medicaid. If you’re young, you may not be worried about healthcare, but proof of insurance is typically a requirement to enroll in college. There’s significant overlap between government and nonprofit programs, so sometimes it’s helpful to find a nonprofit agency who can gauge what your needs are before guiding you through the options and application process. One of your best bets is to step inside a community action agency, which gets state and federal funds to the people who need them. If you can’t easily get to one of the 19 agencies in Oklahoma, search 2-1-1 Oklahoma, which connects citizens to human services in their area. 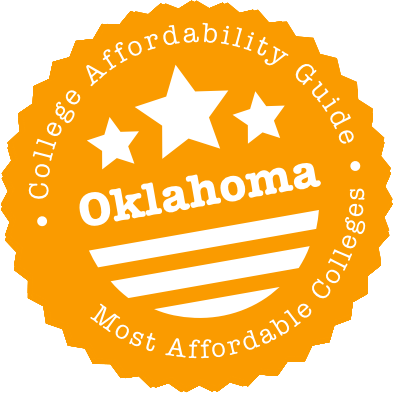 Many Oklahoma colleges provide high-quality on-campus housing for a great price. Northwestern Oklahoma University has four residence halls, with highly affordable options for private rooms and semi-private rooms (cheaper than off-campus rents!) Cameron University in Lawton has similar low rates for students who willing to share a bathroom down the hall. Of course, if you have a partner or kids, you probably don’t want to live in a residence hall, no matter how cheap it is. Most schools, including Oklahoma State University, have family housing, though it’s more expensive than a residence hall. Once you know your situation, plug some numbers into a calculator that can compare housing-related costs on and off campus. Living off campus isn’t necessarily a bad idea—rents and utilities are generally below the national average, and the Sooner State has some of the lowest gas prices in the country. However, living away from the hubbub of campus may not be an option. Some colleges in the state, including Oklahoma Baptist University, require students to live on campus all four years. Such colleges don’t provide much in the way of support to off-campus students. Other schools, though, have many students who are commuting or living nearby. University of Central Oklahoma meets their needs through its Off-Campus Life Department. The department publishes an off-campus housing guide covering things like tenant rights and maintains a Zillow-ish platform for finding a place (and roommates to go in it). If your school doesn’t have its own platform, try one of the dozens out there for apartment hunting. A state-specific one is ApartmentLocator, but CampusRent.com may have more student-friendly offerings. If you need a place this week and don’t have the money to make it happen, search HomelessShelterDirectory.org. Utility costs in Oklahoma are reasonable, but to keep the lights on, you have to pay the bills. There are two statewide services that can help with this if you’re a low-income resident. The first is the Low-Income Home Energy Assistance Program (LIHEAP), which makes sure Oklahomans have a cool house in the summer and a warm one in the winter by providing cash assistance for bills. The second is the Weatherization Assistance Program, which sends a technician to review your home for spots that might be draining energy — and then fix them for free. For weatherization, you can go to the Oklahoma Department of Commerce to get some basic info, but it’s probably easier to skip ahead to applying through a community action agency responsible for handling applications and distributing funds. If you don’t qualify for either of these government programs, see what your utility company can do for you. At the Public Service Company of Oklahoma, for instance, you can do an online assessment of your electricity usage to identify areas for savings. Both OSU and OU have medical schools, but neither one is located on the main campus — OSU Medical Center is in Tulsa instead of Stillwater, and OU’s is in Oklahoma City instead of Norman. Still, having these nonprofit teaching hospitals around lowers the overall cost of healthcare in the state and can help you breathe easier if you need urgent medical attention. However, if you’re just feeling run-of-the-mill sniffles or are looking for birth control or immunizations, a campus clinic is often a good bet. Many schools roll the costs of health centers into student fees, so check to see if you’ve already paid for some services. That’s the case at Northeastern State University, where office visits are free but labs cost extra. In many cases, you might also have automatic accident insurance like that provided at Oklahoma Baptist University, especially useful if you slip on a patch of ice coming out of the dorm at midnight. Read these policies over in case you ever have to make a claim — it could save you money. If the price for healthcare still isn’t right, look over the Oklahoma Charitable Clinic Association’s list of free and charitable clinics. It can also connect you to low-cost dentists if you can’t get to the OU College of Dentistry in OKC, which has exceptionally low rates through its student-run clinics. If it’s mental health treatment you’re concerned about, the state has 15 community mental health centers that work with people of modest financial means. It’s probably better to start at your college’s counseling center, though. Most, including Cameron University, do not charge for sessions, and their professional counselors can refer you to outside services if needed. Some schools cater to students with kids. Cameron University’s CU Be SMART program even has a resource center on campus for student-parents. University of Central Oklahoma doesn’t have its own child care center, but it does recognize its student-parents with events like the annual Parents Night Out, in which you can meet other students with families while the school pays for babysitting. If you need child care a bit more regularly, several schools have child care centers that run at a low cost because they utilize students from their early education programs. For instance, the OSU Child Development Laboratory admits one- to five-year-olds and has scholarships for families with financial need. As a student, you should also apply for a child care subsidy through the state, which opens up many options for where to place your child in day care or preschool. Find a provider at Oklahoma Department of Human Services. Oklahoma gas prices are cheap, but here’s the thing: Oklahoma is spread out, so people drive farther and pay more. Even if you live two miles down the road from campus, why spend money on a car, insurance, maintenance and parking when you can probably hop on a bus for free? Your college website likely has a section detailing transportation options and letting you know about student discounts. Whatever your car situation, you should check this section out. Otherwise, you might miss, for instance, that Northwestern Oklahoma State University runs free shuttles from major Oklahoma and Kansas bus stations and airports at the start of the semester. There are a couple of university transportation networks that are so large that they’re hard to miss. These include the OSU/Stillwater Community Transit System, which is free for students, and Cleveland Area Rapid Transit (CART) serving Norman and OU, also free. University of Central Oklahoma’s system isn’t quite as big, but students ride gratis on the City of Edmond’s Citylink Transit. Oklahoma has an above-average rate of food insecurity. Food security is particularly important for students, who need calories to keep their brains on and zoom from class to the library and back again. For this reason, schools across the state have set up campus food pantries. The Tahlequah RiverHawk Food Pantry at Northeastern State University is open on Tuesdays and Fridays in the University Center basement. All you need is a student ID, and it’ll hook you up with nonperishable groceries. Central Pantry at University of Central Oklahoma requires proof of financial need and is open from 9:00 to 4:00 five days a week. Let’s say your school is behind the curve on establishing a food pantry. Don’t go hungry. There are more resources than you might think. If you’re in western or central Oklahoma, go to Regional Food Bank and enter your ZIP code to find a food pantry in your area. If you live elsewhere, go to Community Food Bank of Eastern Oklahoma. It’s especially important to eat a good diet if you’re pregnant or breastfeeding, and the WIC program can set you up with a card good for certain items at neighborhood supermarkets. You can go to the Oklahoma State Department of Health for WIC info, but the website is spotty, so try going directly to a WIC clinic to get started. Members of the Cherokee Nation can get information here. Nearly everyone seems to agree that OKC is a cheap place to live; housing costs are particularly affordable.. Oklahoma is an oil-producing state with low fuel prices to prove it. And the University of Oklahoma Medical Center’s presence guarantees lower costs for healthcare. So, if you’re a student inside the city limits (perhaps at Oklahoma City Community College) or on the outskirts — University of Central Oklahoma is 15 miles north of town, and Oklahoma Baptist University is 36 miles east — you’re well-placed to get a quality higher education in a low-cost environment. Community Action Agency Of Oklahoma City and Oklahoma/Canadian Counties runs over 30 Head Start centers and day care facilities in the OKC metro area, making it an awesome resource for student-parents of all financial backgrounds. Don’t have kids? CAA of OKC also has other services for low-income residents, including free tax filing (through the Volunteer Income Tax Assistance program) and rent payment support during emergencies. Consumer Credit Counseling Service of Central Oklahoma is there if you’ve dug yourself into debt and don’t know how to get out. But it also wants to prevent people from being underwater in the first place, which is why it runs the Fiscally Fit Boot Camp, where you can take six sessions exploring finance tracking, budgeting, credit, borrowing, debt and investing. Neighborhood Services Organization has three main services: low-cost dental care (e.g., tooth extraction for $60) for people without insurance; a WIC clinic where you can get breastfeeding support and free food for mom and baby; and transitional housing for families, pregnant women and single men who don’t have anywhere else to stay. Oklahoma City Community Foundation manages 120 scholarship funds for area residents, though you won’t qualify for all of them, as many are earmarked for graduates of particular high schools or students majoring in specialized fields. To get started, file the FAFSA, get your transcript, make a resume and gather references. Then, fill out an application and see which scholarships match your background and aspirations. Go to Heartline 2-1-1 resource directory for more like this in the Oklahoma City area. In many ways, Tulsa is like Oklahoma City. Its got a nice downtown and a low cost of living, making it a city you might consider staying in after college. Speaking of which, the two most notable schools in the city are private ones — University of Tulsa and Oral Roberts University. It also hosts the largest two-year institution in the state, Tulsa Community College. Community Action Project Tulsa is all about families. Its free early learning programs for children from low-income families gets them ready for kindergarten, while specialists from its Family Advancement programs work individually with you to prepare financially and academically for postsecondary education. Neighbor for Neighbor can help if you don’t have insurance because it runs a free medical clinic, dental clinic and optometry clinic. The NFN Food Store can also give you a month’s worth of groceries, and its legal clinic will help you negotiate if you owe money to landlords, banks or auto dealerships. It even holds individual and group counseling sessions for people who need to set goals or budget to make them a reality. Tulsa Community Foundation distributes $1 million in scholarships every year to Tulsa residents, drawing from around 30 separate funds. There’s almost certainly something you qualify for, with awards earmarked for everything from members of a local Gay and Straight Alliance to Bixby High School soccer players. YMCA Tulsa has several types of low-cost child care you can take advantage of: two child development centers that accept DHS subsidies or use sliding-scale fees based on income; before- and after-school child care for children enrolled at local public elementary schools; and a parents’ night out every month, so you can drop off your kids for fun activities while you cram for a test. Go to 211Tulsa for more resources in T-Town. Norman is just a stone’s throw from Oklahoma City, so the cost of living is about the same. Given that the city is best known for the massive University of Oklahoma, though, don’t be surprised to find some savings directed at college students. For one thing, OU attendees can get around town for free on CART buses. For another, there are happy hours and college bands galore to make the social scene affordable. Bridges of Norman has a unique mission. It serves area high schoolers who are living on their own and trying to work their way through secondary school. It gives them a cheap place to stay and tutors them through high school. They get career coaching and even scholarships to encourage them to go on to higher education. If they take this route, they can stay in their Bridges apartment until their college graduation. Center for Children and Families is a great resource for new parents juggling the stress of school and the pressures of parenting. The Bringing Up Babies program sets up free regular home visits between counselors and pregnant mothers to help get them through childbirth and the first year of parenting. Its Baby Pantry is stocked with free diapers and wipes for parents who couldn’t otherwise afford to change diapers frequently. Central Oklahoma Community Action Agency uses government funds to administer initiatives such as the Home Weatherization Program, where homeowners of modest means can get drafty doors, cheap windows and poorly insulated walls fixed for free. If you’re squinting while reading your textbooks, COCAA can help you pay for glasses, along with any prescription medication. And its even got places to stay if you’re in between couches. Legal Aid Services of Oklahoma has offices across the state, including in Norman. If you don’t have much money but are embroiled in a civil case (or need a lawyer’s advice), perhaps related to an eviction or debts, Legal Aid will work on your case pro bono. The United Way of Norman Community Resource Guide is packed with additional services. If what you need isn’t mentioned above, it’s probably listed there.